The picture was created to illustrate a book of poems about a fisherman. The poet decided not to publish and does not wish to be acknowledged. In this poem a fisherman sees leaves on the surface of the water metamorphosising into fish and comparing their transience to the passing of seasons and to life itself. 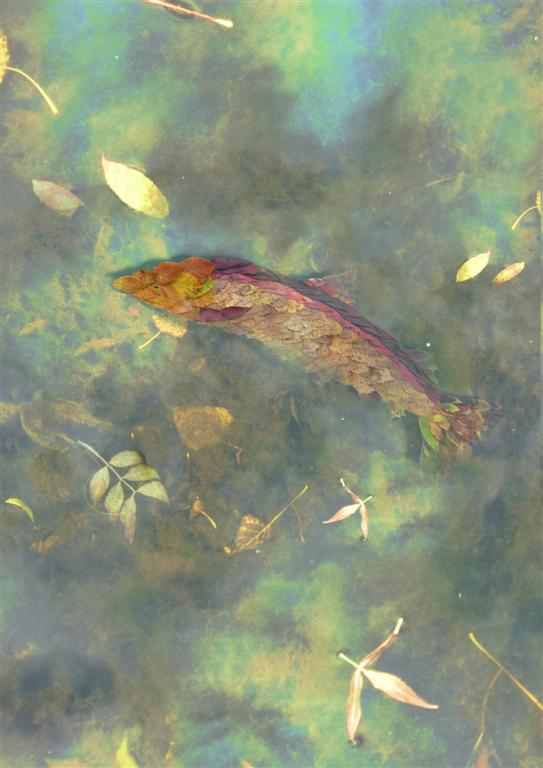 To further his concept I introduced the reality of actual autumn leaves to the formality of the fish shape as a collage. A photograph of this was 'submerged' in Monet-style digitally created water to produce a picture with a dream-like quality. The combinations of real and unreal have found new form and swim on by illustrating and emphasising the poet's perception of the passage of time.